The option is offered in efforts to provide customers with knowledge of flower choices available, increase online sales growth, and promote an easier selection process. Peachtree Petals, a recognized leading Atlanta florist specializing in premium floral arrangements and wedding floral decor services, announces their variety and price options for their bouquets. The option is offered in efforts to provide customers with knowledge of flower choices available, increase online sales growth, and promote an easier selection process. Peachtree Petals pursues to be the best choice for floral services and floral decor throughout the US. The Peachtree Petals variety and service options are found within its' very own "Variety And Options" page on their website. Within the tab on the page, customers can navigate their cursor over the Variety and Price page, which will then list the variety and price options. The variety of Peachtree Petals flowers include asters, carnations, daisies, hydrangeas, lilies, tulips, roses, orchids, sunflowers, plants, and more. Customers can select the flower of choice and browse the Peachtree Petals website for all the floral arrangements which contain that specific flower. All of the flowers the florist offers are not listed, therefore customers are recommended to contact Peachtree Petals to inquire whether it is in stock. The Peachtree Petals price option offers customers the ability to browse the website via the price range within their budget. The price option ranges include under $40 and in increments of $10 after the $40 price amount (i.e. $40 to $50, $50 to 60). The final price range is $100 and over. If a customer does not find a bouquet they are looking for, Peachtree Petals also offers custom designed floral arrangements, in which the floral shop will create a floral arrangement for the client's requested dollar value. These options within the Peachtree Petals website promote user friendliness and order intakes online. 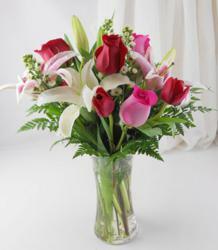 Peachtree Petals is a recognized leader of superior floral arrangements and honored Master Florist nationwide. Their floral designers have over 50 years of experience and create stunning floral arrangements. Peachtree Petals has its' very own staffed Atlanta floral wedding consultant to meet their clients' needs. Based in Atlanta, Georgia, Peachtree Petals services a growing list of clients, including company floral subscriptions and weekly floral services.